A lot of people who watch TV all over the world and see the Ukrainian bloodbath find it pretty disturbing, but still really distant. This makes me remember the well-known quote of the British Prime Minister Neville Chamberlain, who said the following about the events in Czechoslovakia right before the World War II: “A quarrel in a far away land between people of whom we know absolutely nothing.” As for Ukraine, I personally think there are three possible future scenarios which prove that the West must be concerned about what is happening in this not very far and away land. Ukrainian territory by areal is equal to France. The population of the country is ten times bigger than in Bosnia and is double as big in Syria. At this moment the civil war in Ukraine has a potential to give a free rein to a conflagration on a scale that one could not see on the European territory since the WWII. The impact that this confrontation can bring to 45 million people of Ukraine will be more than tragic. Historic cities such as Odessa, Lwiw or Kyiv could eventually face with the massive destruction once seen in Sarajevo and Aleppo. The EU would need to handle an unprecedented refugee crisis and finally, the conflict would transform into direct battle between the Western and Russian allies. If you take a look at the results of the presidential elections that took place in 2010, you will see the extent of the country’s divisions. The west and north parts solidly gave their preference to Yulia Timoshenko, while the south and east voted for Viktor Yanukovich. This means that the risk of Ukraine splitting apart in one of the most horrid and possible scenarios. 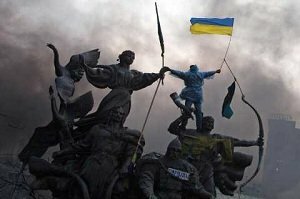 If Vladimir Putin turns out to be the winner in this massive conflict, Ukraine will be most likely sucked back directly to the orbit of Russian Federation. This means that all hopes for the EU association will be buried. Instead, Ukraine can simply become an integral part of Eurasian Union with its key dominator personified by Moscow. All plans to build the Western-style democracy will simply sink into oblivion. Instead, there will be a new Cold War-manner division of the whole continent. As for the Russian president, he may be willing to impose a more threatening and aggressive policy in order to put pressure on NATO and EU members in the Baltic countries and anywhere all over Eastern Europe. At the same time, I am sure there is still some hope for a certain solution of the crisis – if all the participants of the conflict find the right compromise; if the West and Russian Federation agree to provide Ukraine with all necessary help needed to restore the country’s weakened economy; and finally, if they let Ukrainian people choose the most suitable way for their Motherland to grow and develop.